We are happy to announce that we raised over $47,000 at our 2018 T2 Cedarcroft event! The generous donations of our hosts, Neal Naff, MD and Nate Hubler as well as our loyal contributors will allow us to continue our important HIV prevention programs, drug research and treatment access advocacy, and to provide valuable financial, educational and emotional support to people with HIV infection. The generous financial donations of our supporters and the time and effort of our loyal volunteers has made a real difference for us. I can’t tell you how much it means to us to receive your continued support at this critical time of deep government funding cuts. We work so hard. It means the world to us to know that people know that we are in the trenches and doing our best to continue the fight against AIDS. On behalf of the AAB Board and volunteers, thank you all of you who attended our event as well as those of you who helped to make it a success again this year. We hope you all had a wonderful time. Please know that your assistance makes a real difference in the fight against AIDS and the ability to keep our doors open. Without people like you, there would be no AIDS Action Baltimore. AIDS Action Baltimore (AAB) has been providing essential services to people with HIV/AIDS since 1987. Thanks to your generosity, we’re still standing after a long hard financial battle. We know only too well that times are still tough, but as we commemorate our 30th year of service, we hope we can count on your continued support which will help us maintain our many HIV/AIDS programs. 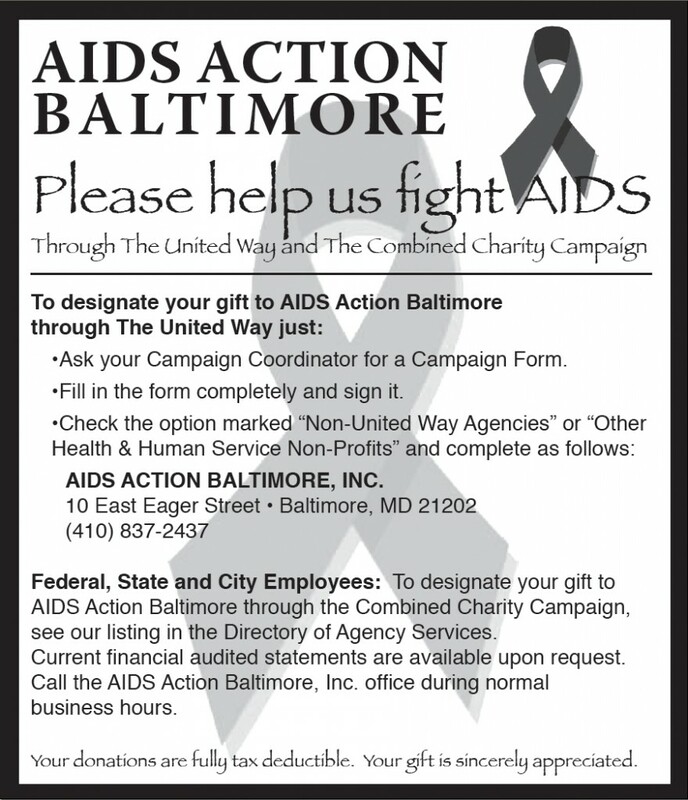 We still desperately need your help to keep our doors open and continue to provide our many essential services to the Baltimore HIV/AIDS community. We hope you will remember us and continue your loyal support. Please help us in any way you can. Your donations will enable us to continue our marvelous record of benevolence and compassion with only a rate of 2.8% overhead in 2016. The amount of work we accomplish and the effect we have had on the war against HIV with only four full-time and one part-time employees is truly amazing! In the latest Centers for Disease Control (CDC) data reported in 2016, Maryland was ranked 5th among U.S. states in adult/adolescent HIV diagnosis rates and 3rd in AIDS diagnosis rates in 2015. The Baltimore-Columbia Towson area had the 10th highest estimated HIV diagnosis rate of any metropolitan area. The CDC estimated that 15.3% of people living with HIV in Maryland were undiagnosed. AAB has been instrumental again this year in the effort to reduce HIV infections in Baltimore. We are currently administering three HIV prevention programs, one for transgender women and two for gay men. AAB’s Project TEA Time is an HIV prevention program for transgender women that promotes HIV testing and helps people get linked to care and treatment. All our prevention programs provide HIV prevention education. Our PrEP UP program promotes PrEP (pre-exposure prophylaxis) use in gay men and transgender women. PrEP is a one pill once a day prevention regimen that has proven to be 90% effective in reducing HIV transmission risk. So far, our PrEP outreach, education, and testing efforts have been extremely successful. We also recently initiated a new HIV prevention program for black gay men called New Horizons. The CDC tells us that black gay men have a 1 in 2 chance of becoming HIV infected in their lifetimes. Our new program seeks to educate black gay men about this exorbitant risk and to help them build networks of support to combat the many obstacles they encounter which contribute to their risk of becoming HIV infected. We are very excited about these new programs and look forward to great results and partnerships in 2017 and 2018. We have also taken a leadership role in promoting PrEP for HIV prevention and testing in gay men and transgender people with the initiation of our new PrEP UP and New Horizons programs. We are educating people about PrEP as well as the latest in HIV treatment, linking them to PrEP and care providers and helping them to stay on their medication. We are very excited about these new monthly support and education programs and hope they will eventually help to decrease the number of people who become HIV infected or stop taking their medication. AAB continues to provide financial assistance to many needy people with HIV/AIDS. AAB has provided this support to over 8,000 people since 1987 with over $2,933,000 in assistance and direct programs to people with HIV/AIDS and their families in our community for items such as rent and utilities. We firmly believe we must continue our invaluable financial assistance programs which provide a safety net to people with HIV/AIDS experiencing an emergency financial crisis. Federal money is steadily decreasing while the rate of HIV cases in Baltimore is still raging. Because federal dollars are shrinking, and who knows what new budget cuts we will experience from the Trump Administration, we need your help more than ever so that we can continue the fight to save our community from the devastation of HIV disease. AAB has worked again this year to advocate for federal budget increases to NIH research funding and continued funding for the Ryan White Care Act for the care and support of people with HIV. We are also still working with national advocates to ensure that all classes of antiviral HIV drugs will be included on new Obama Care Act drug formularies. HIV policy gets more complicated all the time, and it is much harder every year for us to obtain the money we need to fight the epidemic. Our work affects all who are touched by HIV/AIDS. Eventually many people with HIV/AIDS will need new drug cocktails when their old drugs are no longer working or because they are causing life-threatening side effects. AAB continues to work on government and industry Community Advisory Boards. We are working with industry to continually change the standard of care by ensuring that their new drug pipelines remain robust, and by replacing more older toxic drugs with more effective, better tolerated drugs and new long acting drugs that will not require daily dosing. We are very excited that scientists have begun to work on HIV “cure”research. AAB is working with government and industry and the national HIV community to make a “cure” for HIV or what we are now calling “HIV Remission” a reality. Even though this will take years to come to fruition, we have to start somewhere. AAB is a member of the Martin Delaney Cure Research Collaboratories (DARE) and amfAR Community Advisory Boards. AAB is also working with DARE researchers to bring additional resources to Baltimore for local cure research projects. We held an HIV Cure Research Forum on October 25, 2017 in conjunction with the DARE CAB. Dr. Robert Siliciano, an imminent researcher in the HIV cure field from Johns Hopkins, gave an excellent presentation, updating the current state of HIV Cure Research. AAB has been instrumental in the formation of the Drug Development Committee of the AIDS Treatment Activists Coalition, a national organization that interacts with the pharmaceutical industry, pressuring companies to study drugs expeditiously and ethically and to include the HIV affected community in all aspects of research and development. AAB is also a leading member of the national Fair Pricing Coalition (FPC), pressuring“big pharma”to price HIV and HCV drugs reasonably, limit price increases, cap ongoing drug prices for government programs like AIDS Drug Assistance Programs and to initiate co-pay programs for patients with private insurance. We have convinced every HIV and Hepatitis C (HCV) drug company to create programs that will cover all the outrageously expensive co-pays and other out of pocket (OOP) costs for people with private insurance. Every HIV and HCV drug company now covers all OOP prescription costs like deductibles, co-pays and co-insurance expenses. Our work directly affects Marylanders with ever increasing OOP prescription costs. We are also working very hard to ensure that people in Maryland and across the country who cannot afford their medications get their drugs for free from “big pharma” through Patient Assistance Programs (PAPs). Our work is way ahead of the curve. This type of advocacy does not happen in any other disease community. The FPC has also taken a national lead in helping to reduce drug prices nationally by working with the US House and Senate. We are still doing our best to help ourselves. 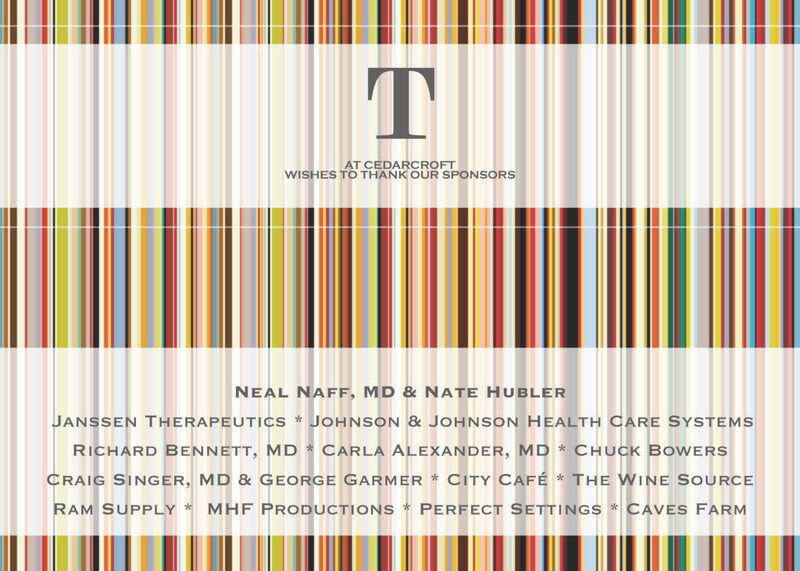 Thanks to the many of you who attended our fabulous Tea at Cedarcroft event at the home of Neal Naff and Nate Hubler which raised over $35,000. 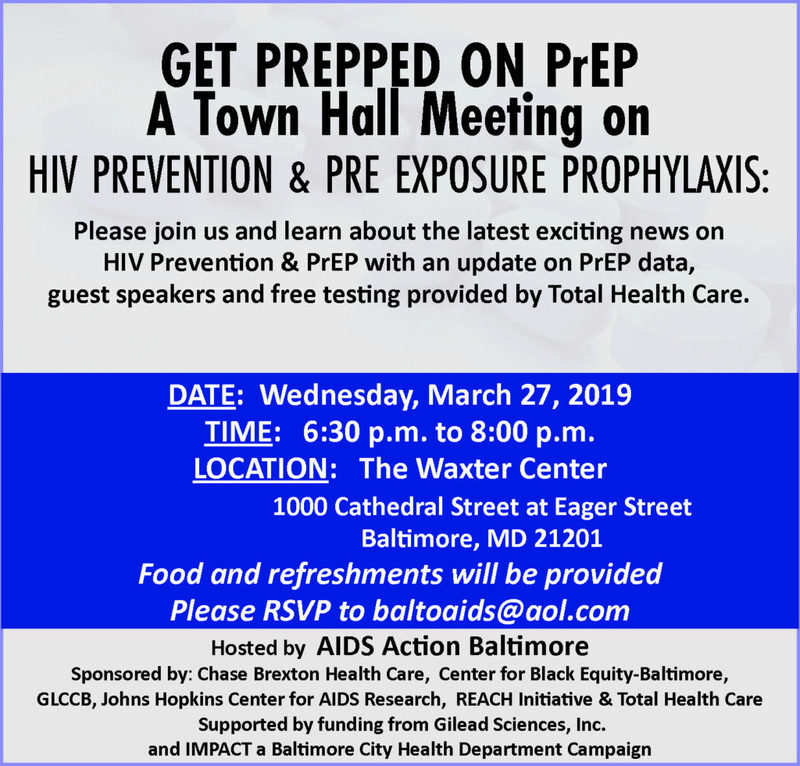 For more information on our events and the latest in HIV treatment and research as well as PrEP for HIV prevention or financial assistance and prescription drug access program information, please check out our web site at www.aidsactionbaltimore.org. Please help us to continue our emergency financial assistance programs and our vital local and national research and treatment advocacy. We greatly appreciate your continued support in these tough economic times. Thank you in advance for your contribution and for your past generosity. We know you are called on to make many charitable donations. We very much appreciate your continued confidence in our work. Your donation will help us to save lives. We are forever grateful for your trust and loyal support. Remember, now more than ever, without people like you, there would be no AIDS Action Baltimore! Our current financial statement is available upon request by contacting AIDS Action Baltimore at 10 East Eager Street, Baltimore, MD 21202 or (410)837-2437. Documents and information submitted to the State of Maryland under the Maryland Charitable Solicitations Act are available from the Office of the Secretary of State, State House, Annapolis, MD 21401 for the cost of copying and postage. Copyright © Aids Action Baltimore, Inc. All rights reserved.